The 10th National Forum was held in St. Louis from June 12-14, and was attended by agents, carriers, marketing organizations, actuarial and administrative firms, and consultants from across the Medigap industry. The CSG team presented in two sessions, discussing the status of the Medigap market, and trends we anticipate will impact the industry. Details for each session are listed below, as well as a copy of the presentation for you to download. Jared Strock, Consulting Actuary at CSG Actuarial, presented with Ryan Wolfe from Mark Farah Associates on the current state of the Medigap market, including trends in new sales premium, enrollment, and rate increases. HealthView Services provided Business Insider with the average annual cost projections for Medicare Supplement Plan F, the most popular level of Medigap coverage, across every state. Check the full article to see how much Medigap Plan F costs in every state, plus Washington, DC. Beginning in 2019, MA plans can leverage the new flexibility to partner with community-based organizations to create services aimed at addressing barriers to access to care or avoiding costly care. The annual Social Security (SS) cost-of-living adjustment for 2019 could top 3%. That would be the largest increase in seven years, according to The Senior Citizens League, a nonpartisan advocacy group. A 3% cost of living adjustment (COLA) in 2019 would be the biggest annual hike since 2012, when SS benefits grew by 3.6%. This year the COLA was 2%. If Social Security benefits increase next year, Medicare premiums for the typical retiree may also rise. A "hold harmless" provision – enjoyed by about 70% of beneficiaries who have Medicare premiums deducted from their SS – prohibits annual increases in Part B premiums from exceeding the dollar amount of the COLA increase in annual SS benefits. Part B premiums are normally deducted directly from Social Security benefits. Call it the Obamacare-Medicare penalty: you sign up for the ACA sometime before you turn 65 and then mistakenly stay there past age 65, when you must switch to Medicare. That results in costly lifetime late-enrollment penalties on your Medicare premiums. Confusion about the transition from ACA to Medicare has been so widespread that the CMS opened up a window for a limited time last year allowing people caught in the switches to apply for relief from the penalties. CMS decided to allow people who should have signed up at 65 to apply for “time-limited equitable relief,” allowing them to enroll in Part B without penalties. Now CMS is expanding that opportunity, but the deadline for straightening out the problem is Sept. 30. Starting July 11, you can complete the 2019 annual certification process for Aetna and Coventry Individual Medicare products (MA/MAPD, PDP). It's one of the annual requirements you must complete to sell our 2019 plans this Annual Election Period. Watch for more details about certification later this month. AHIP launches 2019 AHIP training on June 18... So why wait until July 11? Simply put, because you can save money. When you complete 2019 Aetna Individual Medicare producer certification, it includes AHIP and costs $125 – That’s a savings of $50 off the retail price! Mark your calendars and plan to certify with us starting July 11. Watch for more details coming soon! Not yet using the Ascend app? Once you’re “ready to sell,” just request access on Producer World here. Your prospects are online – Why not enroll them online too? To start using the Ascend app, login to Producer World, go to the Ascend Virtual Sales Office app section and then click on "request access" to get started. If you have questions about the Ascend app, just contact your local Aetna Medicare Broker Manager. Don’t forget to fill out an event verification form when you hold a sales meeting or event about our Individual Medicare plans. The form helps protect you and Aetna if CMS decides to audit your event. It’s easy to complete. Just download the form and print it out before your next event. Then, have the form signed by your event venue contact before your event starts. Lastly, keep the form on file. You can learn more on Producer World. If you have any questions, just contact the Aetna Medicare Broker Services Department at 1-866-714-9301 or brokersupport@aetna.com. AEP for Plan Year 2019 will be here soon and Humana is looking forward to a great sales year! Get certified or recertified with Humana! We are pleased to announce the details for Plan Year (PY) 2019 Certification and Recertification. Humana is making it easier for you to locate and complete certification training by making certification a single course. After successful completion of the online-only course, you will be certified for all Medicare products. We hear from agents and partners like you that certification and recertification takes too long to complete. For PY19, we have managed to make significant improvements to course content and overall course outlines while preserving the high quality training that is expected with Humana. In short, you will notice shorter course outlines and will be able to more easily take away content that you need. All Certification Courses Launch Tuesday, July 10, 2018 at Noon EST. All Recertification Courses Launch Tuesday, July 17, 2018 at Noon EST. External Agents will have until November 30, 2018 to Complete Recertification. 2019 AHIP is required for both Certification and Recertification. Agents typically take AHIP through Humana after they have logged into training from our Humana site. If an agent goes directly to AHIP to register, the fee is $175.00 and must have their AHIP results transferred to Humana before they can continue completing their certification or recertification. IMPORTANT: We are not recommending or suggesting that agents should take AHIP as soon as it is available by going directly to the AHIP site. Agents going directly to AHIP will be shown the AHIP e-commerce site where they are required to pay AHIP for their AHIP training, and that rate will not be the Humana discounted rate. For agents who typically have the AHIP fee waived (career and certain non-career agents) they must go through the Humana site to have the AHIP fee covered upfront. For those agents required to pay the AHIP registration fee, the 2018 charge is $125.00, if the training is accessed via the Humana MarketPoint University. Closing of PY18 Certification - What Agents Need to Know! Each year, we must take down the current plan year Certification courses in preparation for the next plan year. This year, Humana’s Plan Year 2018 Certification course closes at 5:00 PM EST on June 15, 2018. AHIP also closes their PY18 training on June 15, 2018. Friday, June 15th, 2018, 5 pm EST – The online Plan Year 2018 Certification materials (MAPD and PDP Cert) will close for enrollments. Tuesday, July 10, 2018, 12 pm EST - 2019 initial certification MAPD Certification will launch. Agents will complete initial MAPD certification training online. Note: Agents who complete the 2019 initial certification are allowed to sell plans with 2018 effective dates through 11/30/2018. All recertification courses will launch July 17, 2018 at Noon EST. If an agent certifies for Plan Year 2018, the agent will also need to recertify for the 2019 selling season. As always, PY2018 AHIP completion and PY2018 Humana self-study is not acceptable for the upcoming 2019 certification plan year. Agents who certify for 2019 on or after July 10, 2018 do not need to recertify for 2019! You can access certification and recertification by logging into the Vantage agent portal from Humana.com. From the Education card in Vantage, click the Humana MarketPoint University(HMU) link. Instructions for locating and starting training are available on the homepage of HMU. The rule could see an array of new benefits aimed at improving health outcomes by addressing issues such as housing and food insecurity, transportation, social isolation and home health aides. Potential benefits include ride-hailing services, home visits, nutritional support, air conditioners for people with asthma, home renovations such as grab bars and other accommodations to prevent falls. 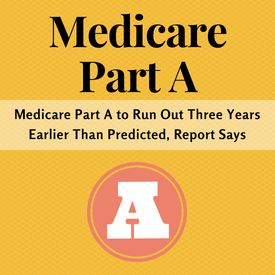 Trustees for Medicare reported Tuesday that Medicare Part A, which covers hospital bills, will become insolvent in 2026, 3 years earlier than the projection last year. In its annual report, the trustees cited lower payroll taxes attributable to lowered wages in 2017, lower levels of projected gross domestic product (GDP), and lower income from the taxation of Social Security benefits as a result of the tax-reform package President Trump signed into law in December 2017. Part A spending is projected to be slightly higher than last year’s estimates, because of legislation that increased hospital spending, and higher Medicare Advantage payments. In 2017, income into Medicare Part A, formally known as the Hospital Insurance Trust Fund (HI), exceeded expenditures by $2.8 billion. The report projects deficits in all future years until the trust fund becomes depleted in 2026. The assets were $202 billion at the beginning of 2018, representing about 65% of expenditures during the year, which is below the trustees’ minimum recommended level of 100%. Growth in HI expenditures has averaged 2.1% annually over the last 5 years, compared with non-interest income growth of 4.9%. Over the next 5 years, projected annual growth rates for expenditures and non-interest income are 6.2% and 5.3%, respectively. In response to the report, there were calls for both reforms and blame. “We should keep our attention focused on reforming these programs so that they can truly benefit future generations,” Senate Finance Committee Chairman Orrin Hatch, R-Utah, said in a statement. The report said that Medicare costs will grow from about 3.7% of GDP in 2017, to 5.8% of GDP by 2038, and will increase gradually thereafter to about 6.2% of GDP by 2092. The annual report also included Social Security projections. Those costs equaled 4.9% of GDP in 2017 and are expected to rise to 6.1% of GDP by 2038, decline to 5.9% of GDP by 2052. By 2092, it will rise to 6.1% of GDP. Preclusion List Requirements for Prescribers in Part D and Individuals and Entities in Medicare Advantage, Cost Plans, and PACE: The Final Rule eliminates the MA and Part D prescriber and provider enrollment requirement. Instead, CMS is compiling a “Preclusion List” of prescribers, individuals, and entities that: (1) are currently revoked from Medicare, under an active reenrollment bar, or have engaged in behavior for which CMS could have revoked enrollment in Medicare and (2) in addition, CMS determines that the underlying conduct is detrimental to the best interests of the Medicare program. The Preclusion List will be made available to MA plans and Part D prescription drug plans, which must deny payment for claims submitted by, or associated with prescriptions written by prescribers and providers on the list. Eliminating “Meaningful Difference” Requirements: Beginning with CY 2019 bid submissions, CMS has eliminated the requirement that MA plans offered by the same organization in the same county comply with the “meaningful difference” requirements, which limit the variety of plans an MA organization can offer in the same county. 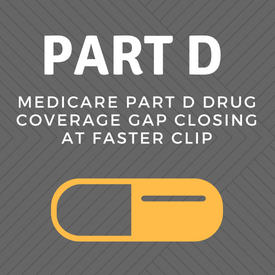 The Final Rule also eliminates the “meaningful difference” requirement for PDP Enhanced Alternative (EA) benefit designs offered by the same organization in the same region, but does not change this requirement as between PDP Basic and EA prescription drug plan offerings. Definition of Marketing: The Final Rule changes the definition of “marketing” to include only materials that are most likely to lead to a beneficiary to make an enrollment decision. CMS is adopting requirements for a new category called “communications,” comprised of materials and activities that fall outside the new definition of marketing. CMS is limiting the availability of the special enrollment period (SEP) for dually or other low income subsidy (LIS) eligible beneficiaries who are identified as at-risk or potentially at-risk for prescription drug abuse. Any Willing Pharmacy Provisions and Revised Definition of Retail Pharmacy: The regulations clarify statutorily-required “any willing pharmacy provisions”, and revise the definition of “retail pharmacy.” The Final rule also sets deadlines for Part D sponsors to respond to requests for pharmacy contracting standard terms and conditions. Expedited Substitutions of Certain Generics and Midyear Formulary Changes: The Final Rule allows Part D sponsors to immediately substitute generics for brand name drugs on the same or lower cost-sharing tier if they meet certain requirements. Part A and Part B Premium Adjustments as “Initial Determinations:” The Final Rule codifies existing policy of treating FFS premium adjustments as initial determinations that can be appealed. Eliminating MA Plan Notice of Forwarded Appeals: CMS has removed the redundant requirement that MA plans notify an appellant when his/her appeal case file is forwarded to Medicare’s Part C IRE, and the Part C IRE will continue to notify MA enrollees of forwarded cases. Default Enrollment: The Final Rule changes the current enrollment mechanism that to allow MA organizations to provide continuation of coverage for beneficiaries once they become Medicare eligible. Similar Treatment of Biosimilar and Interchangeable Biological Products and Generic Drugs for Purposes of Low Income Subsidy (LIS) Cost Sharing. : CMS is applying generic cost-sharing to biosimilar and interchangeable biological products for LIS enrollees in all phases of the Part D benefit. Restoration of the Medicare Advantage Open Enrollment Period: Effective for 2019, the Final Rule implements a new Medicare Advantage open enrollment period (OEP) that will take place from January 1st through March 31st annually, and that will allow individuals to make a one-time election to go to another MA plan or Original Medicare. Removing the Quality Improvement Project (QIP) from Quality Improvement Requirements: The Final Rule removes theQIP from quality improvement requirements. According to CMS, the QIP was duplicative of activities MA plans were already doing to meet other plan needs and requirements, and its elimination allows MA plans to focus on one project that supports improving the management of chronic conditions. 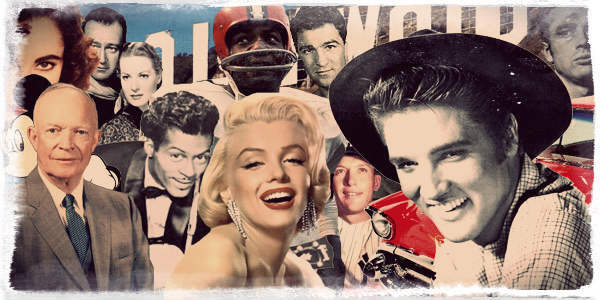 Check out this article full of great information, best practices and overall solid advice on how to market and engage the baby boomer generation. Who Are The "Greatest" and "Post War Generation"? Hope you enjoy and learn some new techniques to benefit your business. The gap for brand-name prescription drugs for Medicare beneficiaries is likely to slip down to 25% of drug costs from the scheduled 30% next year, thanks to the Bipartisan Budget Act of 2018. Agents may want to explain to their clients to compare Part D options during the Annual enrollment Period late this year, enabling them to take advantage of the gap and save on prescription costs.